Wrinkles, sagging skin, and poor skin quality are common concerns so you are not alone. As we age and the production of the ‘scaffolding’ proteins of collagen and elastin within our skin starts to reduce, many people find that skin becomes lax and wrinkles appear more visible. The overall texture of our skin is also negatively affected by the physical ageing process, with many people complaining that their skin appears dull, dry and lackluster. Profhilo is a big step forward in combatting these issues so we were delighted to add it to our list of treatments at Appearance Based Medicine. Since its introduction, it has become one of our most popular treatments. In fact, it is my personal favourite and has become an integral part of my skin regime. Profhilo has been designed to tackle these signs of aging through effective skin bio-remodeling and was awarded the Aesthetics Award for Product Innovation of the Year 2016. It has also caught the attention of the media with Tatler, Grazia and Good Housekeeping reporting on its benefits. Click here to read the full article: “Do the latest skin injectables deliver”. Profhilo is an injectable treatment that specifically targets a 2cm radius of the injection site, with the product being gradually absorbed into this specific area. As a result, if the face is being treated, there are just 5 injection points on each side of the face to ensure optimal distribution and absorption of the slow release Hyaluronic Acid formula. Once the absorption process has started, Profhilo stimulates the production of 4 different types of collagen and elastin. It is this stimulation that results in significant improvement of tissue quality and skin tone, as well as improved overall texture, hydration, and radiance. Profhilo also helps to increase the firmness and elasticity of the skin in the treatment area. In addition to the face, it can effectively be used for rejuvenating the neck, décolletage, arms, knees and hands, all areas which have, in the past, been difficult to treat successfully. Profhilo delivers great results as a treatment on its own but also helps to enhance the results of other aesthetic treatments. Click here to read the full article in Aesthetics. 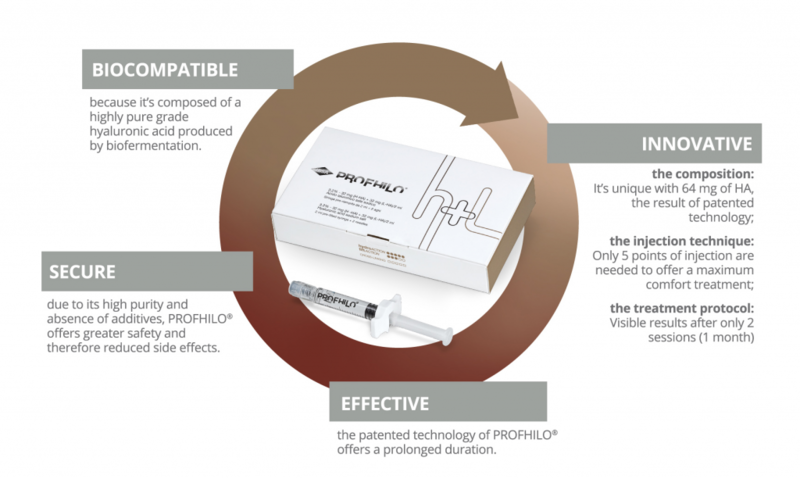 What are the risks or side effects associated with Profhilo? Profhilo was launched in February 2015 in Italy. Since then it has been used all over the world with over 150,000 patients treated and no adverse reactions reported. From a safety perspective, Profhilo is highly biocompatible. That’s because it is made from ultrapure, natural Hyaluronic Acid and is stabilised without the addition of chemical cross-linking agents. This reduces the risk of adverse reactions. The downtime is minimal. The five injection sites are noticeable immediately after the treatment but they start diffusing very quickly and usually disappear completely by the next day. We do advise people to avoid strenuous exercise and direct sun exposure for a few days. Having said all of that, I would never treat any client without first completing a thorough skin consultation and taking a full medical history. Not all products are right for everyone and it is important to understand what each client is trying to achieve and identify any contra-indications before recommending a particular treatment. Clare McLoughlin has been a general nurse since 1988 and is an Independent Nurse Prescriber and advanced procedure aesthetic nurse and trainer with over 18 years’ experience in the aesthetic field. As a recognised aesthetic trainer, Clare is known for her professional approach and skill in the field of aesthetics and has appeared on a number of television programmes performing injectable aesthetic treatments. Clare started Appearance Based Medicine in 2004, to enable her to provide the highest level of patient care and satisfaction. As well as training other Healthcare professionals in this field, Clare is a member of the British Association of Cosmetic Nurses (BACN) and British Association of Sclerotherapists (BAS) and is recently published in Aesthetics Journal.